If you click on the picture a larger version of the scene will open in a new window. From 1840 to about 1935 the boatyard was operated by the Jinks family, who lived at Top Lock House. On a larger copy of the old photograph below, the words on the sign over the wooden shed next to the house can just about be made out as 'R. JINKS, Horse Shoer & General Smith'. 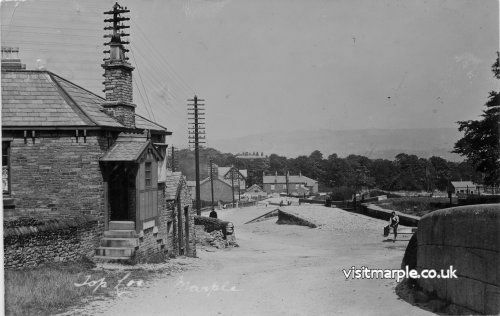 Probably the best known member of the family was James Jinks who served for many years as a local councillor and also as chairman of Marple Urban District Council. 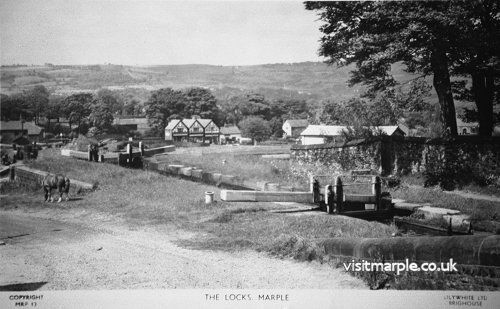 The area around Top Lock had a much more industrial appearance before commercial traffic ceased due to the dominance of the railways, as can be seen from the picture above and the two below of Lock 16. The firs tone showing the toll house is particularly spartan, without a blade of grass in sight. Top Lock looking down Lockside, apart from cars, virtually unchanged! Panoramic view of Top Lock - Mark Whittaker.